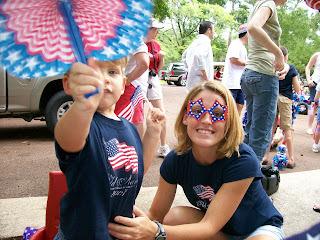 This year, Dawson participated in his very first 4th of July parade. 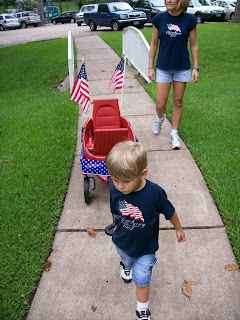 It was a small parade hosted by our neighborhood, so it consisted mainly of decorated golf carts, bicycles, and wagons. 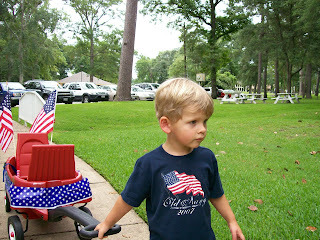 Dawson was happy to see all of the other children and their very patriotic wagons, tricycles, and bicycles. 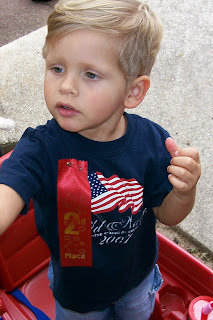 And despite minimal decorations, Dawson received a 2nd place ribbon for his decorated wagon, which he was proud to wear on his shirt the rest of the morning. Dawson sat in his wagon for a few minutes, but preferred to pull the wagon. When he tired of pulling it, he wanted me to carry him. So for about a half-mile I had to carry a very heavy child in one arm and pull our wagon with the other. 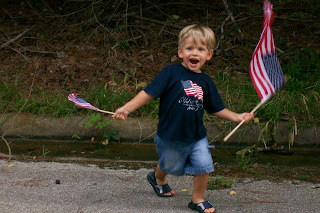 Even when I was carrying Dawson, he enjoyed waving his little flag at all the spectators that lined the street. And when we arrived at the Olympic pool (the final destination of the parade), he was thrilled to swim and splash in the pool. All in all, it was a fun experience.